CLOHERNAGH, TRAMORE BACKSTRAND: 9 Little Egrets, 29 Greenshank, 1 Kingfisher. CLONEA STRAND: 1 Little Egret, 5+ White Wagtails. KILMINNIN, DUNGARVAN: 9 Little Egrets, 380 Redshank, 1 Common Sandpiper. THE CUNNIGAR, DUNGARVAN: 2 Little Egrets, 1 Whimbrel, 800+ Dunlin, 105+ Ringed Plover, 3 White Wagtails. 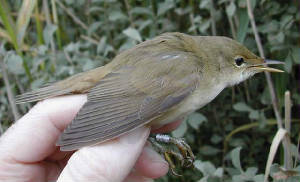 BELLE LAKE: 1 juv Reed Warbler and 1 Blackcap trapped & ringed. BROWNSTOWN HEAD: 1 Merlin, 1 Sedge Warbler, 3 Willow Warblers, 2 Chiffchaffs, 1 Goldcrest. CASTLETOWN BOG: 1 Hen Harrier. KILMINNIN, DUNGARVAN: 1 juv Mediterranean Gull. DUNGARVAN (various sites): 6 Little Egrets, 420+ Black-tailed Godwits, 200+ Redshank, 1 Common Sandpiper. BALLYSHUNNOCK RESERVOIR: 2 Ruffs, 3 Ringed Plover. KNOCKADERRY RESERVOIR: 3 Little Egrets, 1 Redshank. CLONEA STRAND: 110 Sandwich & 2 Common Terns. HELVICK HEAD: 1 Sooty Shearwater, 1 Great Skua & 20 Puffins flew W in just over an hour (1740-1855 hrs); also 1 Arctic Skua chasing terns. BROWNSTOWN HEAD: 1 Pied Flycatcher, 5 Willow Warblers, flock of 19 Choughs. TRAMORE BACKSTRAND: 35 Little Egrets, 466 Oystercatchers, 270+ Redshank, 1 Whimbrel, 1 Common Sandpiper. BALLYSHUNNOCK RESERVOIR: 1 Common Sandpiper, 1 Dunlin; water levels very low. BROWNSTOWN HEAD: 7 Wheatears, 1 Whitethroat, 1 Chiffchaff, 3 Willow Warblers. TRAMORE BACKSTRAND: 22 Little Egrets, 70+ Sandwich Terns. KILMINNIN, DUNGARVAN: 580 Redshank, 10 Greenshank, 1 Common Sandpiper, 1Whimbrel, 200+ Black-tailed Godwits. 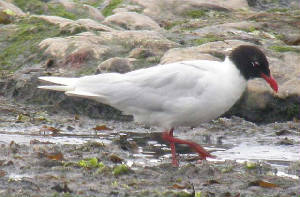 CLONEA STRAND: 4 Mediterranean Gulls (1 2nd-winter & 3 juveniles), l Little Egret, 1 Whimbrel. BROWNSTOWN HEAD: 1 Swift, 1 Sedge Warbler, 2 Chiffchaffs, 1 Willow Warbler. CLONEA STRAND: 4 Mediterranean Gulls (1 adult & 3 juveniles), l Little Egret, 1 Whimbrel, 29 Common Terns, 28 Sandwich Terns. 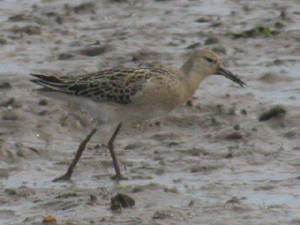 BALLYNEETY, DUNGARVAN: 2 juv Ruffs. THE CUNNIGAR, DUNGARVAN: 1 Ruff. 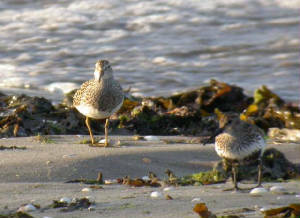 BALLYSHUNNOCK RESERVOIR: 3 Green Sandpipers, 2 Common Sandpipers. HELVICK HEAD: 1 Pied Flycatcher. BROWNSTOWN HEAD: 1 Pied Flycatcher, 5 Willow Warblers, 1 Chiffchaff, 2 Whitethroats, 1 Wheatear, 3 Swifts, flock of 20 Choughs; 68 Storm Petrels, 915 Manx Shearwaters, 2 Arctic Skuas & 22 Common Scoters flew E in an hour (1010-1110 hrs). HELVICK HEAD: 1 Pied Flycatcher, 5 Willow Warblers; c.1000 Manx Shearwaters and 63 Storm Petrels, mostly flying W, also 2 Pomarine Skuas, 3 Arctic Skuas, 1 Great Skua and a Sunfish during a morning seawatch; 7 Storm Petrels flew W 1710-1810 hrs. BROWNSTOWN HEAD: 8+ Willow Warblers; 8 Storm Petrels flew E (seawatch 1940-2020 hrs). HELVICK HEAD: 1 Arctic Skua, 1 Storm Petrel & 2 Puffins flew W (seawatch 1920-2030 hrs). CLONEA STRAND: 1 Black Tern, 1 juv Mediterranean Gull, 3 Whimbrel. HELVICK HEAD: 1 Arctic Skua. BELLE LAKE: 1 juv Reed Warbler trapped & ringed, 1 Blackcap. TRAMORE BACKSTRAND: 1 Spoonbill* at Summerville / Ballinattin. CLONEA STRAND: Juv Mediterranean Gull. BROWNSTOWN HEAD: 2 Willow Warblers. BALLYSHUNNOCK RESERVOIR: 2 Little Egrets. CLONEA STRAND: 130 Sandwich Terns. 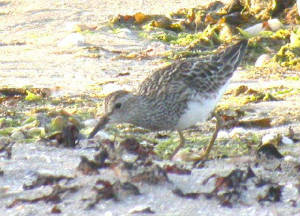 THE CUNNIGAR, DUNGARVAN: 1 adult Pectoral Sandpiper seen again. 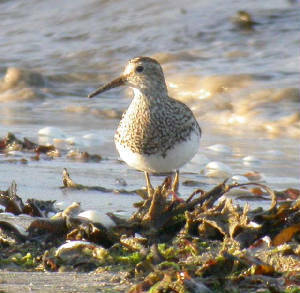 THE CUNNIGAR, DUNGARVAN: 1 adult Pectoral Sandpiper (only the 2nd county record) - see photos. 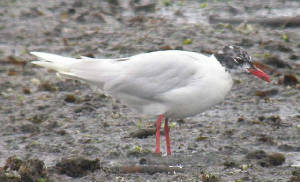 CLONEA STRAND: 2 Mediterranean Gulls (adult + juvenile). 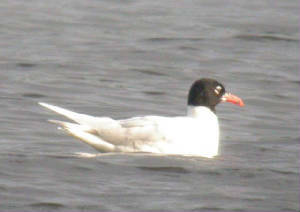 CLONEA STRAND: 3 adult Mediterranean Gulls -see photos. HELVICK HEAD: 1 Great Shearwater. KILMINNIN, DUNGARVAN: 2 adult Spotted Redshanks. BALLYNEETY, DUNGARVAN: 1 adult Little Gull.